German Forest (Deutscher Wald) Gold Coins are inspired by the iconic trees that are found in the vast forests and woodlands that dot Germany. This sought-after series of .9999 pure gold coins began with the Oak German Forest Series Gold Euro in 2010 - the first time that a 1/8 oz gold coin with a denomination of 20 EUR was issued by the German Government. The collection continued with the Beech (2011, Spruce (2012) , Pine (2013),Chestnut (2014) and Linden (2015) and it’s worth noting that all sold out before their release dates. German Forest Gold Euros are produced by all five of the country's major mints, so buyers can expect outstanding quality and workmanship. Buy limited edition German Forest Gold Coins with coininvest.com – they're a great choice! gold Euro coins. As a result, coin collectors and investors can look forward to diversifying their portfolio with a unique 1/8 oz. 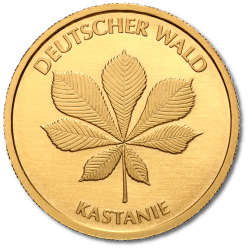 gold bullion coin dedicated to the German Forest. In all, there are six Deutscher Wald coins featuring 24-karat gold and a face value of 20 Euro. With a new design each year, this unique collection is an excellent investment opportunity whether you get the entire set or a part set. You can buy the Deutscher Wald coin from the CoinInvest online store. All you have to do is select the product you would like to purchase by clicking on your chosen image above. This will take you through to the product description page where you can add your selection to the shopping basket and either proceed to check-out or continue browsing our online store. 20 Euro Deutscher Wald side show began in 2010 with the launch of the Oak. This was followed by the Birch in 2011, the Spruce in 2012, the Pine in 2013, the Chestnut in 2014 and the last of the series is Linden. The coin series is minted in five of Germany's leading mints, Berlin, Munich, Karslruhe, Hamburg and Stuttgart, but only 40,000 golds are manufactured annually. Therefore, if you want to add the Deustcher Wald series to your coin collection make sure to get in early! The Deutscher Wald series is dedicated to trees found in the German forests. On the front of the coins is the design of the specific leaf, the name of which is engraved on the bottom curve. The words DEUTSCHER WALD indicate which series the coins belong to. On the reverse we find the Federal Eagle, a nationalist symbol of the German Republic. Encircling the Eagle is 12 stars, representing the 12 founding members of the European Union. The year, 20 Euro face value and country of origin also feature in the reverse side. Germany does not have one several mint that produces commemorative coins, thus the workload is shared between the countries five leading refineries, each of whom carry their own identification mintmark; Berlin – A, Munich – D, Stuttgart – F, Karlsruhe – G, and Hamburg – J. The Deustcher Wald series only features six coins, the first of which was launched in 2010 and ended in 2015 with the Linden. Given the reputation of precision German engineering, consumers can be assured that the coins are manufactured to the highest quality. Germany has produced gold bullion coins since 1873 when they introduced the Goldmark but this was removed from the gold standard after the First World War. The delay in bullion production however, did not disrupt the German's knack and determination to develop techniques that allowed them to produce gold bullion coins to the highest standards. In modern day Germany, the production of coins is shared between five mints, all of which have individual techniques but each capable of producing highly manufactured products. The German Federal Republic take crime prevention very seriously and incorporate the latest security techniques in the products to help protect investors against receiving counterfeit goods. Investors can therefore be assured they are receiving merchandise that are 100% authentic. As a leading distributor of precious metals in Europe, CoinInvest is always keen to hear from anybody with Deutscher Wald gold coins for sale – especially valuable collector's items like the Deutcher Wald series. If you are looking to cash in on your assets give us a call today and get a quote from one of our friendly staff. We offer highly competitive rates at current market prices and confirm a fixed-fee offer by email.